In recent years there has been a substantial boom in the construction of museums in the West. Every city has wanted to have its own museum showpiece that would draw, as a high-quality cultural attraction, more tourists to the city. The most well-known example is the Guggenheim Bilbao, the new building designed by Frank Gehry that brought world fame to the dilapidated Basque seaport. The Netherlands has the Groninger Museum designed by Alessandro Mendini, which provided an impulse to tourism in the isolated northern Dutch city. What these museum buildings, a product of city marketing, have in common is their architectural exuberance. The traditional tasks of museums, such as the collecting of art, seem to be of secondary relevance in these kitschy new buildings which declare themselves to be the main event. 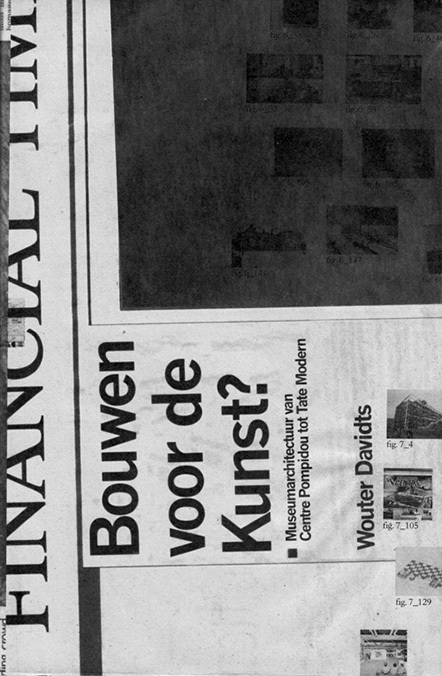 Typically enough, Wouter Davidts has little to say in his book Bouwen voor de kunst? Museum architectuur van Centre Pompidou tot Tate Modern about these public success stories that give every public official responsible for culture wet dreams. Somewhat dutifully, Davidts describes the rise of the spectacular façade construction and points out how much these museums are the result of the increasingly fierce competition between cities for the cultural consumer. He disposes of these newly built museums with their ostentatious exteriors and utterly uninteresting and interchangeable interiors as ‘schizophrenic’. In these buildings no thought has been devoted at all to how architecture can provide meaning for art, he states disappointedly. Rather than dwell upon these architectural extravagances, Davidts deals at length with museum architecture that does take into account what happens inside the building and how this determines the building’s entire essence. His interest in museum architecture is of a programmatic nature and thus focuses as much on content as on outward appearances. The basic assumption of the book is that the museum of art (the genre that Davidts restricts himself to here) is no longer a shrine where masterpieces are preserved. The privileged status which for centuries gave the museum a powerful identity and an appropriate temple-like appearance is increasingly being abandoned in favour of the model of the workshop, in the hope that the museum can better connect to developments in contemporary art. Davidts calls this new type of museum, which emerged in the 1970s, a ‘dynamic machine’; the Centre Pompidou built in 1977 and Tate Modern from 2000 amount to the most important examples. Under the inspiring impetus of jury member Willem Sandberg, the Centre Pompidou building committee devoted itself to the realization of the cultural supermarket, which conflicted with the museum as it was then perceived. The conspicuous building in the middle of Paris, in which all the utility ducts are affixed to the façade to create space, consists of stacked open floors without a single obstruction. The suggestion here is that everything is possible, but practice eventually proved to be more intractable. The ‘liberated’ anti-museum strove for optimal transparency and flexibility in an attempt to offer the artist an ideal workplace like his own studio, but all too soon came up against the dilemma that the desire to be a production site does not go together well with the museum’s other function, that of a shelter. The national museum of modern art, spread over two floors of the Centre Pompidou, was refurbished in the 1980s with fixed walls and routes for a permanent collection of non-contemporary art. Even the view of the city has largely been sacrificed, making the return to the white cube, deprived of time and topicality, complete. As a result, the Centre Pompidou became a bit of a temple. Davidts’ judgement is harsh. In fact, the ambition of the museum to be a workshop, equivalent to the artist’s studio, has thrown it into an even deeper identity crisis than the one it was in after giving up its status as a temple. Of the workshop idea, which aspired to be closer to the topical sources of art, nothing remains but an illusion, so that the building merely offers the impression of a cultural factory without actually being one. Despite these crippled ambitions, Bouwen voor de kunst? offers no swansong to the museum of art. The chapters on the Centre Pompidou and Tate Modern at the end of the book represent the apotheosis of a story lasting several chapters about the intriguing interaction of art and its (architectural) environment. This begins with the moment in the nineteenth century when art was uprooted, when it initially was able to survive thanks to the museum. The writings of Paul Valéry and Marcel Proust immediately demonstrated that the museum was not, nor could be, a definitive home for art. Art does not fully correspond to the place in which it is shown and so the museum also only offers a limited framework. There is always elsewhere to which art refers and for which it longs. The elsewhere of new meanings that art carries but that only there will express itself. The idea that the museum is the definitive destination of all art (which underlies the ideal of the eternal depository) appears to be a persistent illusion. Artists in the 1960s and ’70s referred to the contextual effect of art, how the meaning of art is dependent on its environment, its presentation and the institutional context in which it is placed when exhibited. Davidts discusses minimal art, Daniel Buren, Robert Smithson and Gordon Matta-Clark and their deconstruction of the relationship between art, space and museum. It is too often thought, he says, that museum architecture is merely there to serve art and should therefore adopt a more reticent position. But this is to ignore the far-reaching interaction in which art and architecture are involved. Even the most flexible space, such as the Centre Pompidou, cannot avoid the interaction, and therefore also the attendant limitations. Davidts does not bring any major new facts to light, but the thorough way in which he charts the history behind the relatively recent typology of the museum as workshop is impressive. Davidts has read everything, interpreted every statement by artists and critics and has succeeded in organizing the abundance of material into a convincing theory. Bouwen voor de kunst? provides insight into one of the most interesting trends in contemporary museum culture, one which continues to be embraced by masses of museum directors. However sincere their intentions, the effectiveness of these is open to question after reading Davidts’ book. It seems time for a complete change in how we think about museums.